From the kitchen table to the boardroom table, the USDA Natural Resources Conservation Service (NRCS) brings people together across the nation for: healthier food, natural resources and people; a stronger agricultural industry; and economic growth, jobs and innovation. Each Friday, meet those farmers, producers and landowners through our #Fridaysonthefarm stories. Visit local farms, ranches, forests and resource areas where NRCS and partners help people help the land. Content may not reflect National Geographic’s current map policy. Sources: National Geographic, Esri, DeLorme, HERE, UNEP-WCMC, USGS, NASA, ESA, METI, NRCAN, GEBCO, NOAA, increment P Corp. This Friday, we visit Marc and Cheryl Cesario, who own and operate Meeting Place Pastures in Cornwall, Vermont, where they raise grass-fed beef and certified organic eggs. With 500-acres of certified organic pastureland, they harness solar energy that is converted into a wholesome and nutritious feed for their animals. The Cesario’s Angus and Devon cows graze during the growing season and are moved up to three times a day to new paddocks. “A lot of people see cows eating grass and think it’s easy, but it’s not,” says Marc. The Cesarios partnered with NRCS, who helped them implement a variety of conservation practices that aim to improve water quality and soil health. Technical and financial assistance to plan and implement these practices is available through the Environmental Quality Incentives Program (EQIP) and the Conservation Stewardship Program (CSP). As a result, they have reduced their dependence on off-farm inputs, improved the health of their soil, protected water quality, and saved time and money. They adopted intensive rotational grazing because they believe it is a more economical way to raise cows. It also gives their pastures more time to recover after grazing periods. Fencing cows out of sensitive areas at Meeting Place Pastures accelerates vegetation recovery and protects soil and water quality. In 2009, the Cesarios purchased their first 97 acres, and immediately consulted NRCS to find out how to transition the corn fields they purchased into organic pasture. 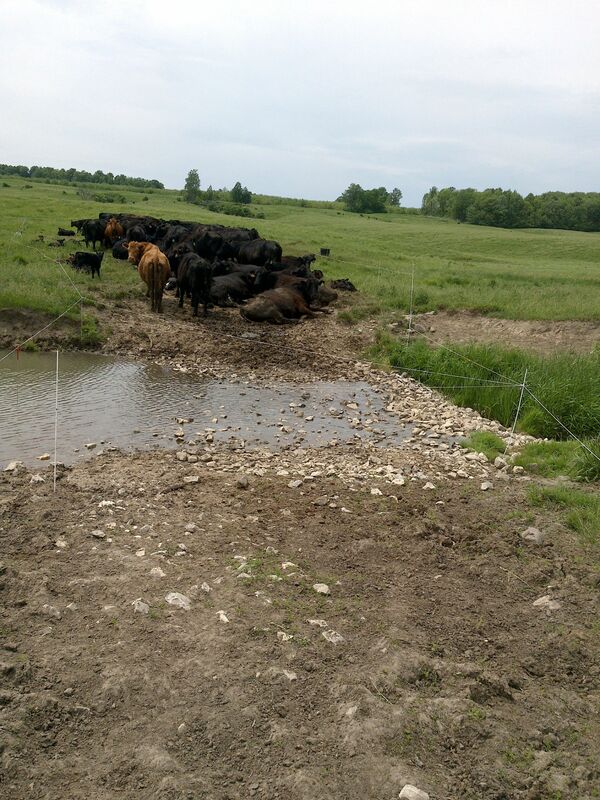 They also planted a hedgerow and trees to provide a buffer for a nearby stream, installed watering tubs and water lines for their cows, and erected fencing to keep the cows out of nearby Beaver Brook. 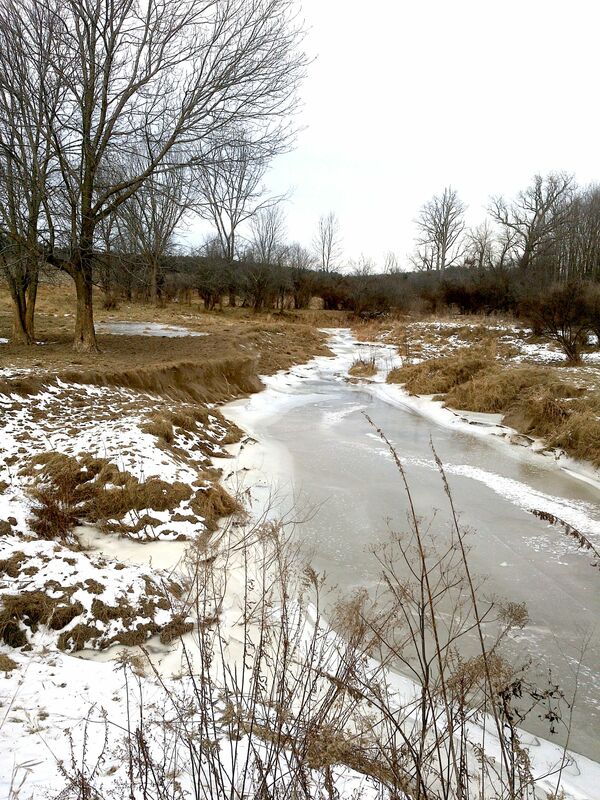 “We did most of our own fencing, but as we added acreage, the assistance we received from NRCS was so helpful because we could do more and make an even bigger impact with conservation,” said Cheryl. Before photo (left) taken December 2016. 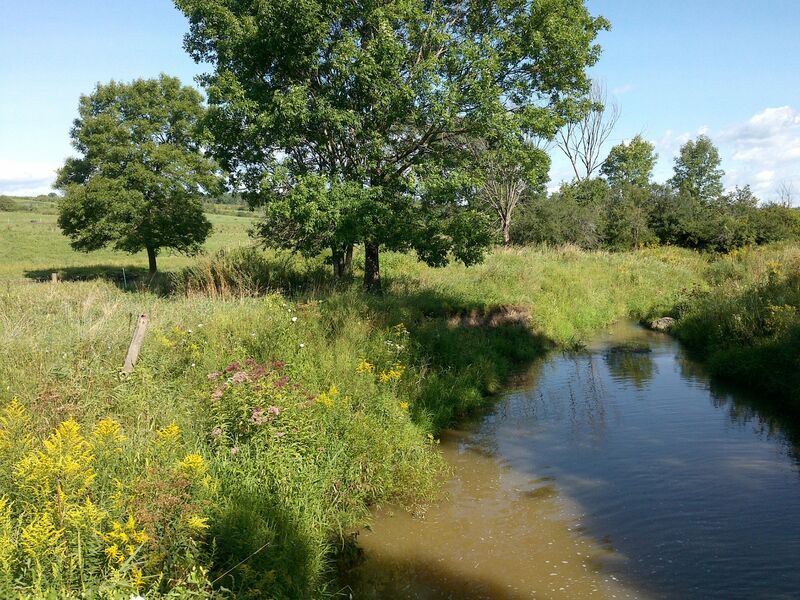 After photo (right) taken at same location in August 2017, along Beaver Brook, after cows had been fenced out all spring and summer. Vegetation helps prevent streambank erosion, runoff of excessive nutrients, and protects and improves water quality. The Cesarios worked with NRCS Soil Conservationist Tim McCoy who helped them develop a comprehensive grazing plan for the health of their animals and their forages. “Fencing cows out of sensitive areas really speeds up the rate at which vegetation recovers,” McCoy said. Their grazing plan is paying off with improved yields and extended length of their growing season. 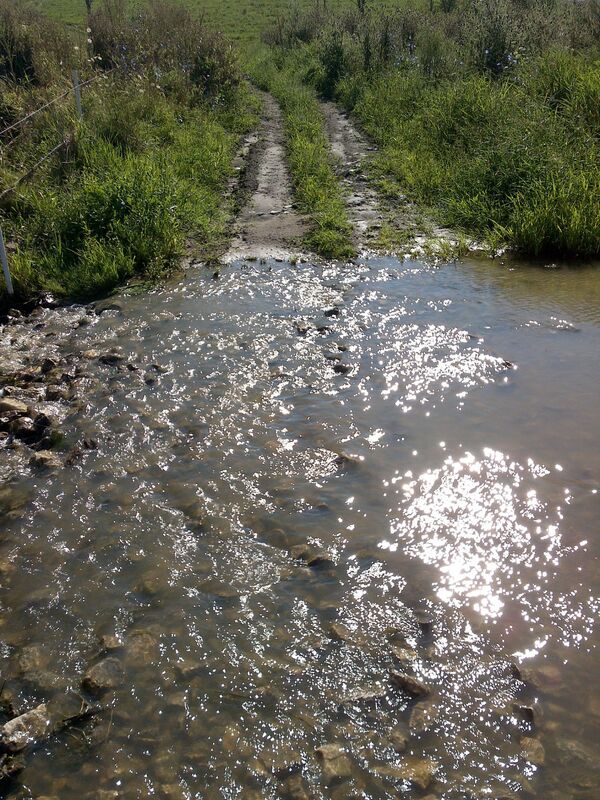 Left: Under previous management, cows were allowed uncontrolled access to Beaver Brook. This created a resource concern because of excess amounts of nutrients that entered the waterway. Right: The area is now protected with fencing and used for crossings only when necessary. This allows vegetation on both sides to regrow. Diverse pasture plantings provide the Cesario’s livestock with a well-balanced, nutritious diet. In addition, using season-specific plantings benefits the entire ecosystem. McCoy says their stewardship makes a difference in the health of natural resources on and around their farm. “Marc and Cheryl have transformed marginal land into healthy, productive pasture and reduced the environmental impact associated with grazing large herbivores,” said McCoy. Marc and Cheryl manage the farm full-time. Cheryl is also a grazing specialist for the University of Vermont Extension. Besides managing multiple herds totaling 290 head, they are also raising their daughter, Normandie Fleurette, who turns four this winter. The Cesarios are excited to see the next generation taking ownership and developing a sense of pride. The NRCS’ EQIP Organic Initiative helps producers conserve their land and also supports USDA National Organic Program standards. Eligible participants receive financial and technical assistance to implement conservation practices and develop conservation plans that address natural resource concerns. Payments are made to participants after conservation practices and activities identified in an EQIP plan of operations are implemented. Learn how NRCS and organic farmers work together on conservation. Follow the #Fridaysonthefarm and other voluntary conservation stories on @USDA_NRCS Twitter and @USDA Facebook. View all #Fridaysonthefarm feature stories.